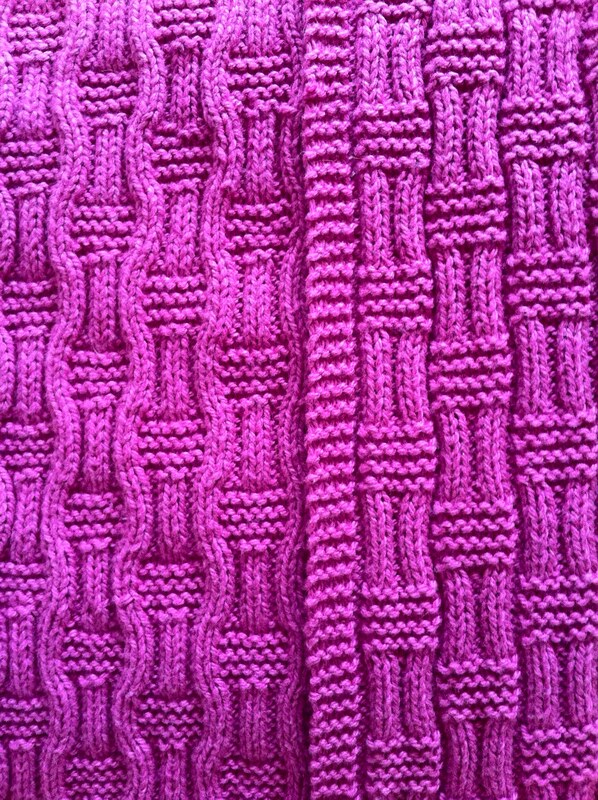 After I knitted my first scarf a few months back, I had a hanker to make something a little more challenging. My friends and their daughter are staying with us this week, so a couple of months ago I thought I’d try to make a baby blanket for her first birthday. As it was to be the third thing I’ve knitted, I was looking for a basic pattern that looked a little fancier than it was. After a bit of searching I found a pattern by The Wooly Knitter on Etsy called Bethan that only requires knit and purl stitches but has a more complicated looking texture. Susan in Mrs Moon helped me choose Spud & Chloë Sweater yarn, a cotton and wool mix in a gorgeous dark pink called Jelly Bean that you can stick in the wash and even in the tumble dryer (on a low heat). So I set about knitting and was quite pleased with myself until I made a mistake a quarter of the way through. I kept knitting convincing myself that it wouldn’t be noticeable but it turned out it was very noticeable so, after trying and failing to fix it, I ended up unravelling it all and starting again. With this little set-back I was rather behind schedule so have spent the last two weeks knitting frantically trying to get it finished in time. My husband has started affectionately referring to me as ‘the claw’, but despite the repetitive strain injury I’m quite chuffed with the finished blanket. 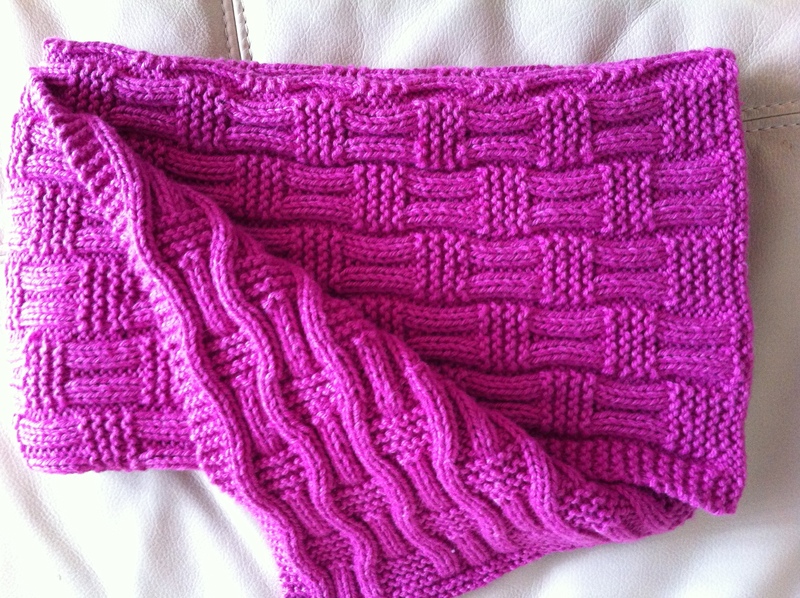 On one side is a wave pattern and on the other a woven pattern. And here is the little lady snuggling up to it with her milk on her birthday. Any recommendations on what I can knit next? Can I recommend the knitting website and database, Ravelry? (www.ravelry.com). Free to join, you can display your knitted items for everyone to see, and it has great advice forums. Best of all, it has a HUGE searchable database for patterns, and loads of free ones too. It has changed knitting forever! If you get on it, I am Impything. See you there! It’s just beautiful!! 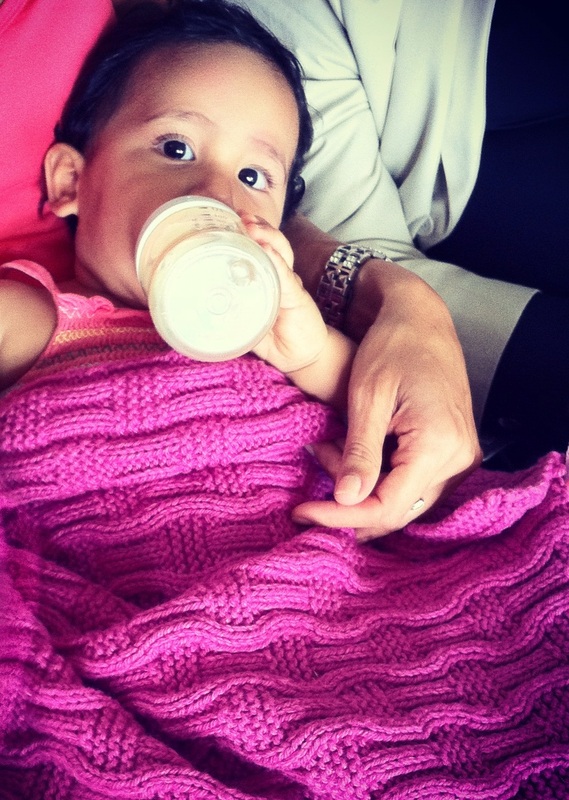 The color is divine and a welcome reprieve from the pedestrian pastel pink that everyone does for baby blankets. BTW, your husband is very funny! For this to be your third project you’ve done brilliantly! I think you could knit anything you set your mind to now. How about a project for your home?